Sometimes the best way to teach a certain principle is to demonstrate it (see Teaching, No Greater Call , 164). Consider asking a family member to demonstrate what one-tenth represents. He or she could demonstrate it by separating one item from a group of 10 items. To conclude, consider inviting a family member to show how to fill out a tithing slip. “Those you teach will benefit from each other’s participation” (Teaching, No Greater Call, 63). 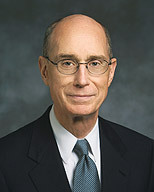 Invite family members to share what they believe President Eyring means by the statement “feel what we need to feel to receive the gift of eternal life.” Consider discussing the three ways in which paying tithing prepares us to feel what we need to feel to receive God’s blessings.